Some time ago my phone stopped giving any notifications when I receive text messages. Given the nature of the problem I have no idea when exactly this happened, as I just thought that I wasn't getting any texts. I have a dual sim Lumia 950 with a T-Mobile sim. This isn't about just the noise/vibration. There is no change in the live tile, and texts aren't showing up in the notification pull down screen, nor on my computer through Cortana. I've restarted the phone multiple times and the problem persists, so I'm stumped. Make sure that your messaging app is allowed to run in the background. If it is not, it won't be able to send notifications, etc. 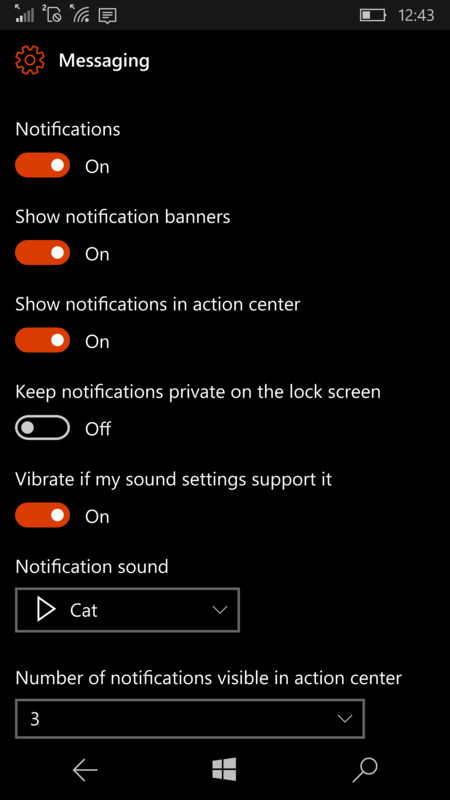 In the settings menu for allowing/disabling background apps the messaging app has the name "Microsoft Messaging" as well as a winking smiley face message bubble which is low resolution a not similar in any way to the standard messaging tile. Don't be confused, as they are in fact one and the same. Not the answer you're looking for? Browse other questions tagged windows-10-mobile sms notifications lumia-950 or ask your own question. Does Skype support push notifications? Avoid locked screen from lighting up on notifications? Restart required message for real?